I guess every1's doin it so.... ill give a review of the newest banlists and my opinions and thoughts abt it. breaker- well, im nt surprised. I wonder if konami intends to ban MOF and breaker in march ban list and unrestrict them in march. A free destruction creature with a formidable 1600 atk. Magician of faith- Retrives your selected spell from the graveyard. Not surprised as well. One of the only few spell retrievers that are good and can be splashable. Call of the haunted- one of konami's most stupid actions. I thought the ban list to be much more sensible than this. As i am writing this i am fuming and my keyboard button's are nearly coming off. This ban list looks like it was made by a noob... call of the haunted is far more much, very very much less better than MR, i'd rather have Premature burial banned than this card. raiza the storm monarch- k0nami has woken up finally. no one likes to be hit by a raiza. Of course limiting raiza means players are gonna run back to square one and PWWB for raiza's effect again. Discuss. I do think that gaius is better and ought to be limited but i guess TCG havent gotten Gaius yet while OCG has.So they want TCg to have a chance running 3 first. Advanced ritual art- Demise staple. I can see Hanrui crying and fretting nw just because this card is limited. The possible second thing i thing is reasonable abt this ban list. Konami finally did something about it, bt failed because nobody runs more than 3. IMO, 3 is too much. No more torture golum/ inferno tempest deckout decks anymore. Still annoying though. Cyber dragon- NO!!!! people cNT play CYber end dragon anymore. WEll, its a lot harder. Colin will scold konami. Foolish burial- No use anyway. No one plays more than 2. Dark armed dragon- Of course this card ought to have been banned. But im kind so i think it ought to have been limited or at least touched. An instant plus 3 and a 2800 atck monster is awesome. effect: Discard one card from your hand to return one card on the field to the owner's decktop. In this format, PWWB proved to be most potent. Raiza the storm monarch was one of the most powerful monarchs and voted most annoying in the game. In the TCG, before LADD was released, raiza was runned everywhere and was voted most powerful card in the game. Until SJ Washington, where champ, Jon Labounty scored the first place with 3 copies of this card in his deck. From the on, this was one of the most sought after trap cards( in the TCG) since it provided a spin off effect like Raiza , players even ran 3 raiza, 3 back to square one, 3 pwwb and 3 legendary jujitsu master to annoy other duelists. This card basically works best in the infamous perfect circle monarch/ LADD deck. Y? First, this card has a discard cost. Players may ask why discard cost? Hand advantage is important. But , at times, u simply need to discards some cards to the graveyard. Ask any PC player and they will tell u they had problems getting needed cards in to the graveyard. PC is the most graveyard oriented deck in this format and no im don think DARK decks rely on graveyards any more than this PC deck. The perfect circle needs to work with the cards such as YOmi frog, Dandylion, Dhero malicious and d hero disk commander. 3 destiny draws, 1 snipestalker and 2 foolish burial isnt ennough to discard those cards to the graveyard. Of course, ppl have bad hands and bad luck. So, by playing PWWb, this card nt only transforms useless cards into useful ammo, it slows your opponent down a turn which is sometimes enough to rejuvenate and refreshen your hand. PWWb is also a life saver and imo a card that generates advantage for you. At times , if your opponent has a cyber end dragon with limiter removal and he has just played all his cards in his hand and spent most of his LP and the entire duel to pull of this one combo. PWWB generates card advantage because if u just played it and return the CED to the fusion deck , your opponent will cry. This card like raiza , its walking counterpart, can target any one card on the field. Unlike other card like reactive armor, claymore mine, dimensional confinement which only activate if your opponent declare battle or dust tornado which only target S/T , this card is a free target, which means most of the time, you have a card to target on your opponent field. Furthermore, this card can be chained to, so if MST, heavy storm, mobius come down, your opponent just wasted a card so thats advantage for your opponent. If this card was destroyed first turn, while set, by an MST at least you will feel more relieved because you have one less S/T removal to worry about. Also, a good combo, would be to discard the freshly drawn yomi frog in the draw phase then revive the frog during the standby phase. Furthermore, if u returned a, dhero diabolic guy or yomi frog of your opponent to his deck top, i gurantee he will cry. yes, if u have dead cards in hand they will be pitched for a good purpose. Also, if premature burial, call of the haunted doesnt have a decent target int he graveyard, you could just discard a high level monster to the graveyard and reborn it. ONLY four monsters in the gravyard? Well use wing blast and pitch one from the hand and use pot of avarice. Thats uber advantage there. What ever the possibilities are, i gurantee that this card will rarely be a dead card and will mostly help you. So get your copies of PWWB and play them now? Will this card be still as versatile in the next format? Well, we'll just wait for the next ban list to see abt tat. Oh well, here i will sign off. so remember to have fun, play fair and don cheat while playing the game. *Destiny hero disc commander- this card is broken. For paying about eight hundred life point or activating a call of the haunted u can SS him from the graveyard and earn two cards. Two cards is a lot in the game , it can help a winning player win even more, it can help the losing player to get back in the game, it can give so many possibilities.....Pot of greed was banned and i expect this to be. *Yomi frog- The biggest, non -situational, easiest to come out,tribute monster in the game! Banning this will kill monarchs. Sure they are kycoo and dd crow maindecked everywhere but the amount of damage this will cause ,before the opponent draws their anti-frog card, will surely be a lot. And anyways even though it is hoped to be banned,it mihg tnot. Because the next set has frogs so konami might not ban it just to "look after themselves"
*phantom of chaos- Has anyone seen the Rainbow dark dragon one turn kill that involves this card? i'm sure you have. DDT makes use of this guy too. So many combos with this cards that is good i think it ought to be limited. RDD- Has anyone seen the otk decks involving it? Like I said konami just hates otk decks. Raiza the storm monarch- well DUH !!!!!!! This card is just as bad as time seal!! Bringing back your opponent a turn is just so annoying!!!!!!!!! Im sure im not the only one complaining. This is the most annoying monarch. I rather have any of the other monarch bomb me but not raiza. Sorry raiza fans. I play 3 raiza too but as much as i hate to use 1 only, its what should be done. Light and darkness dragon- If disc commander is banned, I expect this card to be not that popular anymore. If disk commander is limited, players will still play this card even if it is at one per deck. This card is awesome. It stops your opponent's cards effect , they waste a few cards to destroy him and then he gets replaced by disc commander which gives the LADD player 2 cards. insanely broken. DDR- A significant side to premature burial. It was limited, why shouldnt this card? Wave motion cannon- With 3 dark bribes and 3 solemn judgment this card is nearly unstoppable and cant be negated. RFTDD- This will make dark otk decks or bazoo ftw decks less scary. Reasoning- These cards are god. They mill through the deck and gives u a free monster. This card is used in the six warlords deck to get some good grub in the graveyard for enishi. Well, i know this list will surely have many disagreement. So, please post your disagreements in the chatbox. For the meantime, we ll just have to wait for the real ban list coming in march. So play hard, play fair and be honest while playing yugioh and have fun too. *some promos such as air circulator , phantom of chaos, belial-marquis of darkness, and bloo-D.
Force of the breaker gave us volcanics and gem beasts as its focus points. Though neither has made it to tier one they are very fun to play with especially the gem beast strategy is very annoying and headache to play against. (that amethyst cat is so hateful and the fact that u see your opponent play gem abundance makes it so hateful since u know u r about to lose the game ). The set also gave us raizer the wind monarch which in my opinion is the best card in the set. g) and the YUBEL monsters!!!! 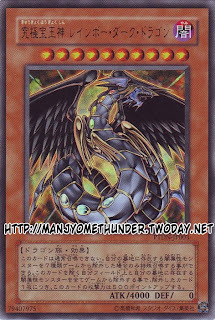 This card that is being reviewed is the rainbow dark dragon. This is the dark counterpart of the ultimate gem lord- rainbow dragon. Its art is one of the best and coolest i have seen so far( far better than the dark simorgh-it looks like a chicken!) Like all the dark counterparts of other cover monsters, this one has a unique effect far easier than the rest (except dark nephitis) . However it isn't that hard to call it out after all, i have nearly 7 dark monsters after 5 turns and i don't play a deck based around this demon. Of course, with 3 armagaedon knight( knight of the end) and 3 foolish burial available , the cost of getting this card out is in fact very easy. Also, u can pack your deck with full of nomi monster and play monster gate or reasoning( name prediction) to fuel the graveyard for this card. Oh yah there is magical merchant also!!. Anyways, its not that hard to get it out. The second effect is what really gets people going. Well its not as broken or as gay as dark arm dragon or light and darkness dragon, but it can go up to 8000 or more. In fact, this card is being used in an oneturn kill deck right now in japan. I remember being pawned by this deck in a tournament and it was really unexpected. The person's deck was finish in just one turn! and so was I.... But after a good 3 minutes of sidedecking, i managed to pull through with 2:1. Of course after using up 7 monsters in the graveyard to summon this monster, this card's attack won't be so high. That's why Phantom of Chaos is being used now. It practically removes the dragon and does the job. This dragon is quite a handy monster also. Being able to recycle itself through repeating nightmare that lets u add up to two 0 defense monster from the grave to the hand. Being 4000 attack lets u sacrifice it for deck devastation virus(DDV of magic) or eradicator epidemic virus( sry don know the japanese name). analyzing the deck: how is the monster line up? The main component of the deck is dark simorgh. Although it is quite hard to draw dark simorgh in a game, the deck doesn't really focus on the cuckoo bird to win the game. basically, 3 raizer and 3 gaius are more than enough to do the job. Raizer slows down the opponent by one turn , giving him/her the deva ju element. Morphing jar is used to speed the deck up giving me 5 new options. The tribute fodder consists of dandylion, 2x dhero diabolical guy and of course the wonderful yomifrog. Gorz is there to provide the element of surprise to turn the game in your favour. Of course, dd crow is in there because it is just plain good. Cards like sangan, breaker are plain staples. Snipe hunter is becoming a staple in most decks nowadays because it actually get rids of useless cards in the hand for a good purpose. Furthermore, it can be used to discard malicious, frog , the dandylion and other stuff that need to be in the grave. How is the spell lineup? The one copy of reinforcement of the army is all i need since i always draw it on my first few turns. XD. The foolish burial helps me to assemble my combos to the graveyard and also it thins the deck so its good. =) The brain control and soul exchange are for the monarchs. Heavy storm and premature burial and pot are in there because they are staples and they provide oneturnkill/ gives my opponent disadvantages, and provide tribute fodder for my monarchs( pre-burial). I don't have another destiny draw so i go to the next best thing, hand severing. As it sometimes, spoil my opponent combos ( who knows? it might help my opponent but i m lucky , don't know why though) Sometimes, i need to discard 2 cards so i look forward to the hand severing. Enemy controller, serves as a swiss army knife since it provides defense, and field control. How is the trap lineup? Urmm...nothing much to say though. Mirror force, Torrential tribute and call of the haunted are just very good and should be abused. They usually don't help me much since this deck controls the field all the time. The 4 phoenix windwing blast is there because its good in the cureent metagame. It discards my useless cards to slow down my opponent by one turn. So it is basically giving my opponent a minus one. And since i get to draw a card (draw phase) and that means i am given a plus one. Also, the 3 solemn judgments are used to negate my opponent's cards and stop his plan halfway. DD survivor is used against macro rfg. cyber dragon is used to speed the deck up if facing up with a faster deck than mine. 2 mobius are used against macro and stall and burn decks. 2 hero rules 2 is to side against a dd crow heavy deck or those decks that rely on graveyards heavily. ithought hero rules 2 could kill dark arm dragon, but i guess i was wrong....anyway, it may not kill the gayest card but it still does enough good things to earn a spot in the sidedeck..
3 flip the mat is just good. It kills volcanic rocket, gadgets, knight of the end( armagaedon knight) , monarchs, gem beast sapphire pegasus, breaker and many more that i can't think of and oh ya, ehero airman!!!! Send a monster from your field to Graveyard, special summon a [Neospacian] monster from your hand. When this card is sent to Graveyard, add a [Neospacian] monster from your deck into hand. LODT-JP003?Miracle Flipper (ミラクル・フリッパー)Light/?/2/?/?When [Miracle Flipper] is on the field, this card cannot be summoned, reverse summoned, or special summoned. When this card is face-up on the field, opponent cannot attack your other monsters. When this card is destroy as result of battle, special summon this card to opponent's field. When this card is destroy by Magic, Trap, or effect of effect monster, destroy a monster on opponent's field. LODT-JP005?Destiny Hero - Dread Servant (Ｄ-ＨＥＲＯ　ドレッドサーヴァント)Dark/Warrior/3/400/700When this card is successfully summoned, put a Time Counter onto [Clocktower of Seclusion]. When this card is destroy as result of battle and sent to Graveyard, you can destroy a Magic/Trap card on your field. LODT-JP008?Volcanic Queen (ヴォルカニック・クイーン)Fire/Pyro/6/2500/1200When this card is play from hand, you must special summon it to oponent's field by sacrificing a monster on opponent's field. Once per turn by sending a card outside of this card from your field to Graveyard, deal 1000 damages to opponent. Also, during each of your End Phase you must sacrifice a monster outside of this card, or this card's controller received 1000 damages. You cannot Normal Summoned the turn this card is special summoned. This card cannot be destroy as result of battle. This card cannot be change to defense mode. 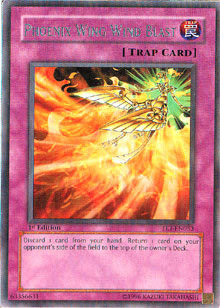 When this card is successfully summoned, reverse summoned, or special summoned, flip a coin and gain the following effect.- Head: Negate the effefct of your Magic, Trap, and effect monster that target this card and destory it.- Tail: Negate the effefct of opponent's Magic, Trap, and effect monster that target this card and destory it. LODT-JP011Arcana Force IV - THE EMPERORLight/Angel/4/1400/1400When this card is successfully summoned, reverse summoned, or special summoned, flip a coin and gain the following effect.- Head: Increase the attack strength of all face-up [Arcana Force] monsters on your field by 500.- Tail: Decrease the attack strength of all face-up [Arcana Force] monsters on your field by 500. When this card is successfully summoned, reverse summoned, or special summoned, flip a coin and gain the following effect.- Head: When this card destroys an opponent's monster as result of battle, special summon that monster on your field.- Tail: Change the control of this card to opponent. This card cannot be Normal Summoned. This card cannot be special summon outside of by sending 3 monsters from your field to Graveyard. When this card is successfully special summoned flip a coin and this gains the following effects:- Head: This card can attack 2 times in a Battle Phase. After this effect apply for 2 battles, change this card to defense mode at the end of (that) Battle Phase. This card's mode cannot be change until the end of your next turn.- Tail: When this card is destroyed, destroy all cards on the field. This card cannot be Normal Summoned. When this card is sent to Graveyard from the deck, special summon this card to your field. When the effect of a face-up [Lightlord] monster on your field outside of [Lightlord Warrior - Garos] would sent card(s) from your deck to Graveyard, send the top 2 cards on your field to Graveyard. For each [Lightlord] monster sent to Graveyard by this card's effect, draw a card. Reverse: You can destroy a card on the field. Send the top 3 cards from your deck to Graveyard. This card cannot be Normal Summoned. This card cannot be special summon outside of when there are 4 or more types of [Lightlord] monsters in your Gravyeard. Pay ??? lifepoints, destroy all cards on the field outside of this card. When this card is face-up on your field, during each of your End Phase send the top 4 cards on the deck to Graveyard. Reverse: Special Summon a [Battery Man] monster with level 4 or lower from your deck, your Graveyard, and RFG zone. Also, when this reversed card is sent to Graveyard as result of destroy in battle, draw a card from your deck. This card cannot be Normal Summoned. This card can only be initially special summoned by removing 2 [Battery Man] monsters from your Graveyard from the game. Remove a Thunder type monster from your Graveyard from the game, destroy a monster and a Magic/Trap card on the field. This effect can only be activate once per turn. When this card is successfully summoned, you can special summon a [Battery Man] monster outside of [Charged Battery Man] from your hand or deck. Increase this card's attack and defense strength by number of Thunder type monster face-up on your field x300. This card can attack opponent directly. When this card successfully direct attacked, and there is a [Gaeru] ("Frog") monster on your field, you can destroy a Magic/Trap card on opponent's field. Sacrifice a monster on your field. Choose a [Gaeru] ("Frog") monster from your deck and special summon it to your field. When this card is face-up on the field, [Gaeru] ("Frog") monsters cannot be destory as result of battle. This card can only be Fusion Summoned by the above cards. Once per turn you can destroy a monster on opponent's field and dealt damage to opponent equal to that monster's attack strength. You cannot have Battle PHase the turn this effect was used. When this card is in Graveyard during your Standby Phase, you can remove a [Destiny Hero] card from Graveyard from the game to special summon this card. LODT-JP04XAntique Gear Ultimate Golem (古代の機械究極巨人)Earth/Machine/10/4400/3400[Antique Gear Golem] + [Antique Gear] monsters x2This card cannot be special summon outside of by Fusion summon. When this card attacks monster in defense moe, and that defense strength is lower than this attack strength, deal battle damage to opponent equal to the difference. When this card attacks, opponent cannot activate Magic/Trap card until the end of Damage STep. When this card is destroy, special summon an [Antique Gear Golem] from your Graveyard ignoring all summoning requirements. Whenever face-up [Destiny Hero] monster(s) on your field is destroy, put a D Counter onto this card for each. During your Main Phase if you successfully summoned, or special summoned, you can send this card with 2 or more D Counters to Graveyard to add up to 2 copies of the same name card as the summoned/special summoned monster from your deck or Graveyard into hand. For each typeof [Neospacian] monster on your field, draw a card from your deck. Send 3 face-up [Antique Gear] monsters from your field to Graveyard to activate. special summon an [Antique Gear Golem] from your hand and/or deck ignoring all summoning requirements. Afterward, destroy all monsters on your field outside of [Antique Gear Golem]. After activation, you cannot Normal Summon for the next of your 2 turns. During your Standby Phase flip a coin. If tail, negate this card's effect until your next Standby Phase.- For the effect of [Arcana Force] monsters activate when successfully summoned, reverse summoned, or special summoned, ignore the Coin Flip and you choose the effect. Also, when an [Arcana Force] monster destroys an opponent's monster, you gain lifepoints equal to the original attack strength of the destroyed monster. Whenever card(s) are send from your deck to Graveyard, put a Shine Counter onto this card. For each Shine Counter on this card, increase the attack strength of all [Lightlord] monsters by 100. When this card is face-up on the field ????? Increase all attack strength of all Water/Aqua monsters with level 2 or less by 1200. Pay 800 lifepoints. Add a Light attribute monster removed from game to your hand. Reborn Ribbon (リボーンリボン)Magic - EquipmentWhen the equipped monster is destroyed in battle and sent to Graveyard, at End Phase of that turn, special summon that monster to your field. Trap - NormalThis card cannot be activate outside of when there existed total of 7 types of [Gem Beast] in your field and Graveyard. Special Summon a [Ultimate Gem Lord] card from your deck or Graveyard ignoring all summoning requirements. Choose an [Arcana Force] monster on your field to activate. The chosen monster gain the opponent of the effect from the Coin Flip. Destruction Hammer (デストラクション・ジャマー)Trap - CounterDiscard a card from hand. Negate the effect of a card with effect of "Destroy monster(s) on the field" and destroy it. Well, the arcana monsters are purely relying on luck, thoush light boundary and maindecking 3 second coin toss should cure the problem. I can see some players actually maindecking cup of ace as there is a trick for you to obtain the side tht you want by flipping the coin. Personally i am excited about Dark valkyria herself. She is probably the best dual monster that is ever released in the OCG. oh well i've to sign of now because have homework to do. New:Junk Synchron (ジャンク・シンクロン)Dark/Warrior - Tuner/3/1300/?When this card is successfully Summoned, special summon a monster with level 2 or less from your Graveyard in face-up defense mode. Negate the effect of the monster special summoned by this effect. Junk Warrior (ジャンク・ウォリアー)Dark/Warrior - Synchron/5/2300/1300[Junk Synchron] + A non-Tuner monsterIncrease this monster's attack strength b the total attack strength of all face-up monsters with level 2 or less on your field. Speed Warrior (スピード・ウォリアー)Wind/Warrior/2/900/300This monster's effect can only be activate on the turn its successfully summoned. You can double the attack strength of this monster during Battle Phase. These are the new cards that are going to be released in the starter deck 2008. of course these cards are of the new rule element . a synchro monster is put in the extra deck. Lol now we will have 4 decks. main deck, fusion, side deck and now this extra deck. Time to find big big deckbox. Lol. well, this junk synchro monster is a good card in a sort if way. level 3 means this card will not be affected by level limit area b or gravity bind. yet it does suxk a bit also. yes, it does give a +1 since u get a free monster but it must be a level 2 or one monster. now not many level 2 or 1 cards are formidable yet to say solid. the best card to reborn would be destiny hero discguy. but the effect of the card is negated due to junk synchro effect. so sorry guys, no diskguy abuse. well, being able to summon a synchro monster does give a plus one card advantage too . but, thats all. this synchro cards will not hit the competitive side yet but it can be a fun deck to play with since you can activate thousand energy to boost up their attack with. Maybe more support in the next few sets will be what we need to make the synchros tier one. but till then, i see these cards just left aside in the binder or extra cards pile to collect dust. Thats all for this article . well, remember play fair and have fun.